The district of Arnavutköy on the European shore of the Bosphorus was one of the closest villages to Istanbul and inhabited as early as Roman times. The name, meaning Albanian Village, is derived from the fact that centuries later settlers from the shores of Dalmatia (who may have migrated there from Scandinavia) made their home in Arnavutköy.The history books tell us that Constantine the Great had a church dedicated to St. Michael built here, which was rebuilt on a larger scale by the Emperor Justinian. The church was looted during the crusader invasion of Istanbul in Byzantine times, and stones from the ruined building used by Mehmet II in the construction of Rumeli Hisarı fortress in the mid-fifteenth century, prior to the conquest of Istanbul. 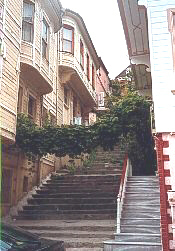 Despite the name Arnavutköy, which dates from the mid-1500s, the population seems to have been mainly Jewish for most of the village’s history, only in later times the balance changing in favour of the Greeks. A publication of the Şirket-i Hayriye (Istanbul Ferryboat Company) written just before the First World War gives the population as 493 Turks and Muslims in 168 households, and 5973 Greeks in 975 households. The Jewish population had moved away after the great fire of 1877 and their place was taken by Muslims. Arnavutköy was particularly at risk from fires, because of its exposed position to easterly winds and to a lesser extent to northeasterly winds which caused fires to spread quickly among the timber houses.In 1871 Americans purchased the waterfront house or yalı of Musuris Paşa and the wooded park behind, and established the American College for Girls. But such dry facts do not do justice to the picturesque atmosphere of Arnavutköy, whose seafront is lined with pretty wooden houses, and whose narrow streets and lanes climb up the hillside behind. Once upon a time Arnavutköy was best known for its woods of great trees behind the village, and its famous orchards and market gardens whose fruit and vegetables were known throughout the country. 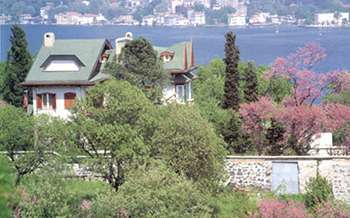 The grounds of the American College, now coeducational, is still filled with great pines, planes, nettle trees, horse chestnuts - whose candles of white and pink blossom light up the woods every spring, and of course the Judas trees whose brilliant cyclamen coloured blossom splashes colour along the shores of the Bosphorus in April. The huge planes were then not confined to the hillsides facing the sea, but filled the valleys and bowls reaching up to the district of Etiler, which has become built up since the 1950s. For three seasons of the year they threw their dark green shade over a Greek Orthodox church and its small cemetery on the slope beneath Etiler. Nearby was a small tavern owned by a former cemetery keeper. For many years its peaceful terrace attracted those who enjoyed the combined pleasure of green surroundings with a glass of aniseed flavoured rakı, the so-called ‘lion’s milk’, which takes on a milky white colour when mixed with water, accompanied by small plates of melon, green peppers, and white cheese. There the time passed so pleasantly, with a little friendly conversation, and the chorus of titmouses, chaffinches and nightingales, that all one’s troubles faded out of sight and mind. Nature was not content just to send high trees thrusting into the sky in this corner of the Bosphorus. The ground was covered by a green undergrowth of thorny bushes, within whose thick unpromising leaves were hidden a surprise gift of God each spring when the pink-white fruits appeared. These were the celebrated Ottoman strawberries associated with Arnavutköy! This delicious fruit, picked one by one and packed into tall narrow baskets, is now a rarity. But in its more abundant days it used to make a delightful gift, filling the air with its delicate fragrance which no preserve or liqueur could quite capture. At one time the small pale pink strawberries of Arnavutköy grown in the market gardens and private gardens of Arnavutköy were so plentiful that the scent hung for weeks in the air around the tiny picturesque ferry terminal from which the strawberries were sent to the city markets, intoxicating the few passengers. Those strawberries were not to be compared with the meaty red lumps fed with hormones which are sold as strawberries today. Two or three decades ago the strawberry fields of Arnavutköy covered 40 hectares (100 acres) and produced between 25,000 and 35,000 kg of Ottoman strawberries and 40,000 to 45,000 kg of European strawberries each year. It is hard to make anyone believe these figures today. And this level of production was moreover at the time when Istanbul’s population was less than a million, not 15-20 million like today. Arnavutköy was not just a paradise of trees, flowers and fruit, but a place where the inhabitants of those lovely old wooden houses were a close knit community of neighbours and friends. Indeed, the same was true for every part of Istanbul and Turkey in those days. But each district was distinct in architectural terms, each reflecting the diverse origins and social status of their inhabitants. The great konaks of Divanyolu, Beyazıt and Süleymaniye, painted in serious colours like ash grey or cinnamon brown, presented an earnest and dignified appearance, like a stiff, uniformed army officer on parade, but within contained lavish magnificence. The exteriors of the huge yalıs of the Bosphorus had a similar stark dignity, and in earlier centuries were only painted a dark red ochre. Not until the 19th century did they acquire more light-hearted tones, such as white walls and green or yellow painted shutters. The wooden houses of Arnavutköy, as the last survivors show, were painted in a wider range of colours and adorned with intricate carving and other decoration on their eaves and balconies, so that I have always likened them to lovingly made birds nests. The grocer’s shops and greengrocers on the corners grew creepers at their doors and trained them over the entrance to provide agreeable shade. The vendors of lakerda (salted bonito) and çiroz (dried and salted mackerel) who arrayed their wares on the pavements in the evenings, lit up their glass jars with strings of light bulbs, transforming that corner into a charming scene. The carved, decorated houses of Arnavutköy were not soulless structures, but each a tiny, uniquely crafted world, inhabited by people of sensitivity. One day in the early 1980s, when I was driving through Arnavutköy up to Etiler, a typical Arnavutköy house caught my eye on the corner of the first small square. On the spur of the moment I asked the driver to stop, and knocked on the door, intending to offer funds to renovate the house. But before I could say a word, the lady who opened the door smiled and invited me in. She said that she had foreseen my visit in a dream, and had been waiting for me for days. I was astonished. The houses of Arnavutköy not only foster dreams, miracles and astonishment, but are filled with memories. In 1937 the 7 year old Çelik (who had just lost his father), walked hand in hand with his mother along the seafront to spend the day with some wealthy distant relatives at their yalı. For the adults the day passed in eating and conversation, and for the children in play. On one side of the house there was the blue sea, and on the other three sides green gardens where the magnolias were in flower. It was like a place out of fairytale. When it was time to go the children of the house protested in chorus that their young visitor should stay for the night. His young mother, Münevver Hanım, had to agree. But as she turned towards the stairs Çelik’s eyes filled with tears, and he begged her not to leave him there. So with happy heart mother and son walked home hand in hand. Years passed and the ruthless cycle of nature’s laws divided mother and son. Who would guess that today the 70 year old Çelik yearns not for yalıs, cars and magnolias, but for a mother to hold him by the hand? Constantinoupolis is a city where ''one can satisfy all one's whims,'' wrote the Italian traveler Edmondo de Amicis in 1878. ''One can light one's cigar in Europe and shake off the ashes in Asia.'' Located on the European shore of the Bosporus, Arnavutköy still exudes all the charm and diversity of the former Constantinople. Here, the bells of the Orthodox church compete with the call to prayer coming from the mosque. Along the Bosporus, fish restaurants abound. Vira Vira offers all the traditional Turkish mezze, or appetizers, including tender fried squid and a scrumptious shrimp stew called güveç. Don't miss the bulama, a main course of fish cooked in a creamy and light sauce of fish stock and mushrooms, spiced up with hot peppers. 1. Cadde 53, (212) 257 1805. Run by a bubbly American named Linda, Deli Kizin Yeri is a charming little souvenir shop whose name mean's Crazy Lady's Place. It sells beautifully crafted objects, jewelry and clothes made from traditional Anatolian fabrics and beads. Francalaci Sokak 2, Tel. :/Fax: (212) 287 1294. Few Greek families remain in Arnavutköy, but a couple of tavernas are still in business. Have you had a frustrating day at the office? NEŞE (pronounced ''neshe'') is a great place to let off steam: After a few glasses of the local anise drink, raki, and a good meal, diners get up, dance to Greek music and break plates. Don't worry — they're not made of fine bone china. Sekbanlar Sokak 29, (212) 265 1093.